Nature's Plus Dyno-Mins® Magnesium, Potassium & Bromelain is an exciting, revolutionary formulation offering peak, mineral support. Dyno-Mins Magnesium, Potassium & Bromelain supplies highest quality Phytavail Magnesium from pesticide-free, hydroponically grown plants. Unlike other food grown minerals, Phytavail Magnesium is 100% yeast-free. 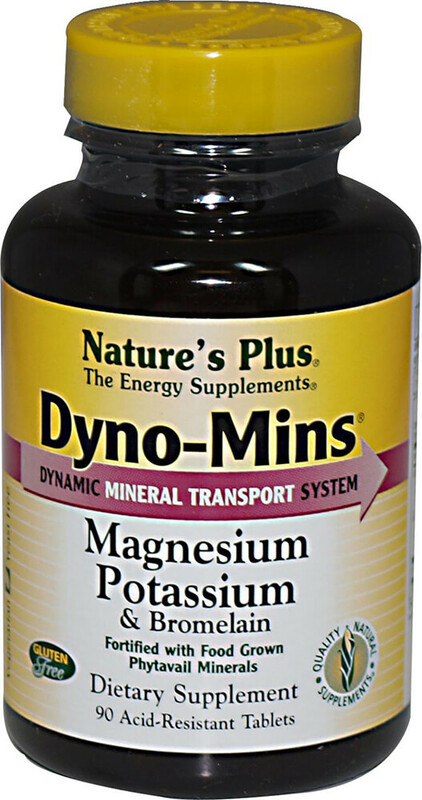 Dyno-Mins Magnesium, Potassium & Bromelain employs the exclusive Dyno-Mins Dynamic Mineral Transport System. Specific organic transporting agents for each mineral, including aminoate citrate, lysinate, ascorbate and aspartate, maximize Phytavail mineral bioavailability and utilization. Dyno-Mins Magnesium, Potassium & Bromelain contains true organically bound mineral chelates, specially coated with acid-resistant protection for increased absorption in the intestines. Mineral aminoates are brown rice chelates. Dyno-Mins Magnesium, Potassium & Bromelain is fused with the proteolytic enzyme bromelain for maximum benefit.